Combining Focusrite's cutting-edge preamplification and A-D conversion with Sintefex's pioneering convolution technology, the Liquid Channel can mimic the most celebrated mic preamps and compressors ever designed. Could this be the only voice channel you'll ever need? The Focusrite Liquid Channel has been one of the most keenly awaited products of the year (or last year for that matter! ), and at recent trade shows the Focusrite booth has always been jam packed with people keen to see what all the fuss is about for themselves. It is the result of three years of joint research and development between Focusrite and Sintefex. I previewed of the product back in SOS December 2003, but the completed product has only now been launched. Part of the delay in bringing this product to market has been the sheer time it has taken to create all of the necessary convolution data required for the 80 simulations of mic preamps and dynamics units. The company have also been working hard to complete the remote control software. Another issue which is still to be fully addressed, but which has slowed progress slightly, is that of copyright. A convolutional processor is, in theory, able to faithfully recreate every sonic nuance of any chosen product. It could be argued, therefore, that by replicating a manufacturer's product with a convolution processor, their copyright may be infringed. Looking at it another way, had that manufacturer's product been reverse engineered and the circuitry copied component for component, the breach of copyright would be fairly obvious — yet the convolutional approach, in theory, produces indistinguishable results. It's certainly a thorny and untested area of law, and it will be interesting to see how things resolve in the future. So what does the Liquid Channel actually do? The brief answer is that it employs dynamic convolution and other very sophisticated technologies to mimic a wide range of classic preamplifiers and dynamics processors — these simulations are referred to by Focusrite as Replicas. There is also some digital equalisation thrown in, some very high-quality digital conversion, and the ability to process line and digital inputs as well as microphone signals. 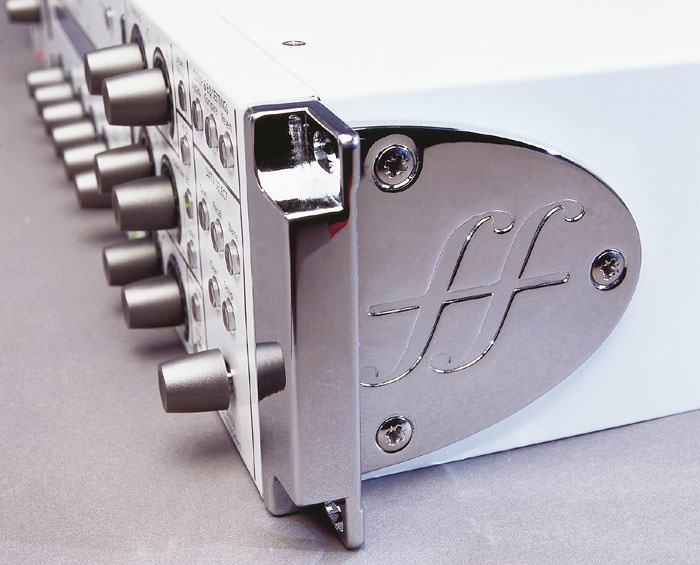 The 2U rackmounting box is painted white, with chunky mirrored chrome rack ears. It is a single-channel processor, catering for analogue mic and line inputs (but no DI input, sadly), as well as AES-EBU digital input. There are analogue and digital outputs, word-clock in and out for synchronisation, and a USB port. The digital interfaces and clocking support sample rates up to 192kHz, with full 24-bit resolution. The USB port is used both for remote control (using the Liquid Control software) and data transfers, to and from a Mac or PC. It is possible to link units together for stereo or multi-channel applications as well, to ensure the dynamics processing maintains a stable image. 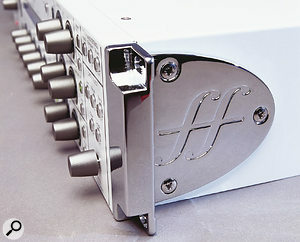 A pair of phono connectors provide the link input and output connections, and each unit is simply coupled to the next in the chain, with the last unit being connected back to the first. The factory set of Replicas contains 40 preamps and 40 compressors, including rare and long-discontinued products alongside many more modern and familiar devices — a complete list is given in the 'The Preamp & Compressor Replicas' box. It's pretty obvious what most of the Replica names refer to, and most identify the country of origin as well as a model number. The audio characteristics of a signal processor — the frequency response, phase response, nonlinearities, and so on — can all be measured in a variety of ways. Once defined, these characteristics can then be recreated. One approach is usually called modelling, where fairly conventional digital signal processing techniques are used to create a sound character similar to the original unit. A more accurate approach is what Sintefex and Focusrite call 'replication' where the exact characteristics of the original signal processor are measured precisely, and then that data is used to modify a new input signal through convolutional signal processing. The result should be a totally accurate recreation of the original unit's characteristics. A particularly useful technique for analysing a signal processor is that of measuring the impulse response. An impulse is a simple click, but the right kind of click can be shown mathematically to contain all signal frequencies (within a defined bandwidth), at the same level and at the same time. If such an impulse is fed into an audio signal processor, the output signal will be different in some way, according to the processing applied. In most cases the duration of the impulse is extended and there may also be level changes, but the precise shape of this 'time-smeared' impulse is unique for the processing applied, and so defines every relevant aspect of the signal processing in a totally precise and repeatable way — it is the sonic equivalent of a fingerprint, if you like. Impulse response measurements are very useful when working with digital equipment, because a single digital sample is essentially similar to a single impulse. For each input sample you need to generate a string of output samples of various amplitudes to replicate the same impulse shape. This imposes the sound characteristics of the wanted device on the input sample, and this stage of the process is the convolution. Each input sample is convolved with data representing the impulse response, which defines the characteristics of the wanted device, to produce a string of new output samples. To make it slightly more complicated, the string of new samples generated for each input sample have to be added to the strings of samples from all the other input samples that came before and after. It's not difficult to do, but it does take an awful lot of sums, and this is what makes convolution a DSP-hungry technology. In fact, although the maths behind convolution has been around for a long time, it is only the recent phenomenal advance in DSP technology which has allowed the concept to be turned into a practical and cost-effective reality for the professional audio market. Things really start to get complicated, though, if you want to be able to change the sonic characteristics on the fly — for example, to change an EQ frequency control. In this case, the shape of the impulse response will also change, because each response is unique to the specific processing applied. Consequently, the signal processing has to calculate or load new impulse responses as the control is altered, and convolve the new data — all without glitches and clicks. In the case of a dynamics processor, things become more complicated still, because the impulse response changes not only as the result of control changes, but also with the changing amplitude of the signal itself — and this is why the Liquid Channel uses dynamic convolution to replicate the processing for its compressor and limiter simulations. One important change from the prototype I played with last year is a rationalisation of the way in which the compressor controls work. There are now two options: a totally authentic As Original mode, and a more flexible Free mode. By default, the unit operates in the As Original mode, whereby the controls and displays recreate the actions and parameter ranges of the simulated unit as closely as possible. Thus, if the original unit doesn't have all the controls provided on the Liquid Channel, those functions are simply labelled Fixed and the controls disabled. If the original model's controls worked in the reverse direction, the Liquid Channel mimics that exactly, and on devices where it is possible to press several buttons at once to create odd (but often useful) effects, the Liquid Channel matches those facilities too. On the other hand, there may be occasions where you want to be able to adjust a parameter even though the original didn't allow that, or adjust a control beyond the original's normal range. The Free mode allows just that — all of the Liquid Channel's controls are allowed to affect the corresponding parameters of the compressor Replica over the full range afforded by the processor, with intelligent interpolation for settings that lie between or beyond those of the original unit. The nature of vintage processors is that no two ever sound exactly the same — component ageing, repairs, and replacement parts all alter the sonic character. Clearly, it isn't practical to measure every classic preamp and compressor and provide all the alternatives in the Liquid Channel, so Focusrite have instead included the ability to adjust the level of harmonic distortion for each Replica. In the preview prototype the control only adjusted the second-harmonic component, but it has been improved considerably in the release software to control the third and fifth harmonics as well, and in realistic proportions related to the input gain setting and the preamp Replica selected. The control range typically spans 0.01-20 percent total harmonic distortion. There will also shortly be a range of 'hot' versions of many of the preamp Replicas with far greater levels of distortion, all available free to registered users, intended to cater for those who want a really cranked-up sound. I've heard many of these 'hot' versions, and they offer very useful alternatives. The Liquid Assets area of Focusrite's dedicated Liquid Channel web site contains downloads of all the existing factory Replicas, and will host any new Replicas that are developed.In addition to the initial factory Replicas, it will be possible to change and update the library of convolution data from a computer using the USB port. 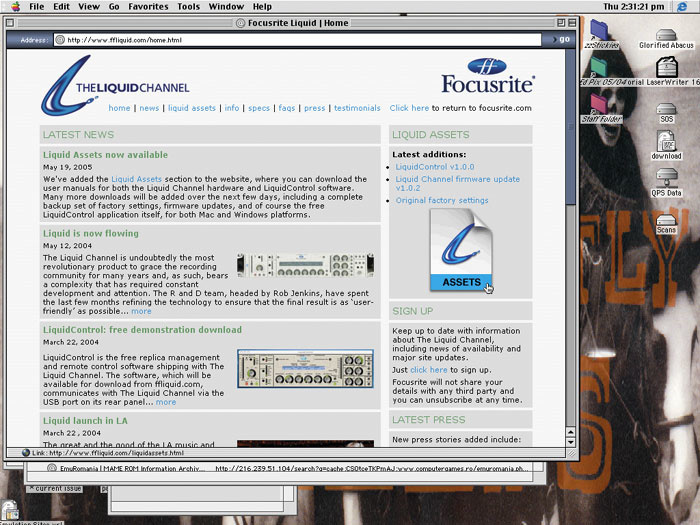 Focusrite have already set up a dedicated www.ffliquid.com web site, and the Liquid Assets page will apparently be offering brand new Replicas for free download on an ongoing basis, although nothing new was yet available there as SOS went to press. User settings of each and every parameter — including mic gain — can be stored in any of 99 user memories, and these may in turn be archived to an external computer via the USB port. The microphone preamp stage is the most sophisticated and complex design that Focusrite have ever come up with (see the 'More Than Just A Preamp' box below), and is followed immediately by a very high-quality A-D stage. From here on, all of the signal processing is digital, but it essentially starts with the convolution of the selected preamp characteristics. This is followed by the convolutional dynamics processing and the digital equalisation, the latter based on the Focusrite D2 plug-in. The dynamics and equalisation can be reversed in their order if required, and the equaliser can be allocated to the dynamics side-chain for frequency-conscious compression. The Liquid Channel can also be used entirely in the digital domain. Clearly, the convolution used to emulate the various dynamics processors is a digital process, and so it is easy to see how a digital signal can benefit from that aspect of the machine. The clever bit is that a D-A stage is included to route the digital input through the analogue preamp's line input. Although this misses out on the characteristics imposed by the matching of a microphone to the preamp, the remaining analogue signal-processing artefacts and characteristics can still be applied to a digital input. Replicating the characteristics of a reverberant space, equaliser, or compressor are far from trivial, as already discussed, but once the measurements have been made it becomes a well-defined problem to solve. Replicating the characteristics of a preamp seems, at first sight, to be equally straightforward... until, that is, you consider the interaction between the microphone and preamp. Equalisers and compressors are generally line-input devices, and the signal levels and impedances for line-level signals are well defined. Provided the device has a reasonably high input impedance, and the source has a reasonably low output impedance, the actual interface plays a negligible part in the sonic character. The same is not true for microphone preamps, where the relationship between its input impedance and the output impedance of a microphone is more complex, with far greater variations between products. Whereas line inputs tend to be predominantly resistive, microphone circuits are inherently more reactive, with significant capacitive and inductive components to consider, particularly where the preamp has a transformer input circuit. As a result, the same microphone may sound different when connected to alternative preamps, and vice versa. These effects play a very significant role in creating the overall sound character, as anyone who has played with a switchable-impedance preamp can confirm, and they cannot easily be created by convolution technology. To do so would require each and every preamp to be measured with each and every microphone, which is clearly an impractical thing to do. The solution which the Focusrite engineers came up with was to simulate the preamp's front-end characteristics in hardware — although even this means that considerable additional measurements are needed to analyse the interface properties. The result, though, is that when the user dials up a preamp Replica the convolution processing takes care of the preamp's own sonic characteristics — the effects of discrete solid-state circuitry, valves, op amps, and so on — while the configurable hardware ensures that the microphone 'sees' exactly the same input impedance and properties as if it were connected to the actual product being simulated. The overall sound character and tonality should therefore be exactly the same as if the identical mic were connected to the original preamp. Making a configurable input stage is not simple, and goes against the normal practice of keeping the microphone signal path as short and simple as possible. Focusrite have had to come up with a complicated arrangement of very high-quality relays to switch various inductors, capacitors, and resistors into the input circuits, in order to provide the appropriate impedance characteristics. Furthermore, a special custom-made transformer can also be switched into the input circuitry when necessary, because it was found that some microphones react with the transformer in a way which can't be captured by convolution. The Liquid Channel has a clean and tidy front panel, with clear legends and meters and a good-sized LCD window. The preamp section occupies the left of the panel and contains a vertical bar-graph meter displaying a 20dB range with a separate Digital Clip LED. Level with the top of the meter, a button cycles through the analogue mic/line and digital inputs, while a fourth LED in the same block illuminates when the selected preamp Replica is using the input transformer. The lower half of the preamp section contains a rotary encoder to set the input gain, the setting indicated with a ring of LEDs around the base of the knob. All of the Replicas benefit from an enormous +6dB to +80dB of gain, even though few of the originals offered anything like that much. Line inputs can be trimmed by ±10dB, and the usual phantom-power, polarity inversion, and high-pass-filter facilities are all controlled by three buttons below the encoder. The filter can be adjusted via a Setup function to turnover at 75Hz or 120Hz, and both positions have a second-order (12dB/octave) slope. To the right of the input section is an area devoted to digital clocking. There are three buttons and various LED arrays, the middle of which steps through the internal clock rates from 44.1kHz to 192kHz. The button below switches the clock source between internal word clock, external word clock, or the digital input, while the top button engages the Session Saver mode. This is a simple automatic gain control which monitors the signal level and reduces the input gain if there is a danger of digital clipping. The middle part of the panel is dominated by a very wide, two-line LCD window, below which are six rotary encoders. Like the input gain control, these all have a ring of LEDs around their bases to indicate the current settings, although their precise numeric values are also displayed along the bottom line of the LCD. The first encoder controls the level and nature of harmonic distortion, as described earlier, and the following five controls adjust the various standard compressor parameters. In order, these are Threshold, Ratio, Attack, Release, and Make-up. The top line of the LCD window shows Replica and preset names, as well as preamp gain, and the divisions between data are not always entirely clear. Above the LCD is a pair of buttons, one at each end, which is used to select alternative preamp and compressor Replicas — the audio is muted briefly while the new Replica is loaded. To the right of the LCD are two more buttons and another vertical bar graph. The buttons enable a Stereo Link mode and switch the compressor into circuit. The meter shows the amount of gain reduction being applied, but the scaling remains the same as on the prototype preview model: a quarter of the range covers just the top 1dB of gain reduction, and the top 3dB occupies half of the meter! However, the effect I commented on in my preview, where the meter display appeared to lag significantly behind the audio signal peaks, has been corrected. 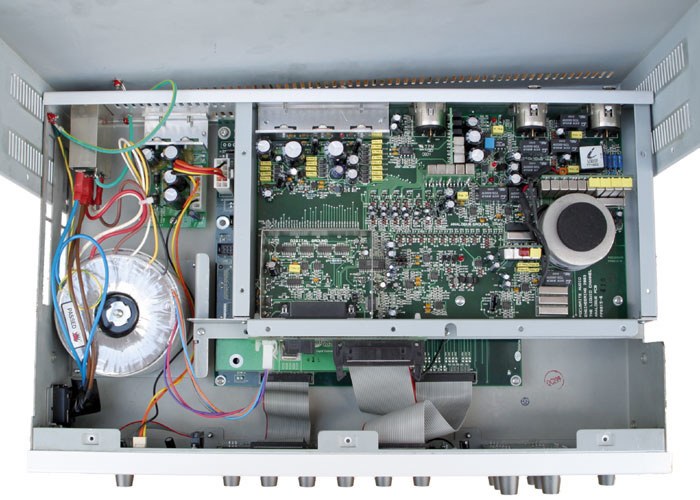 Each band of the three-band equaliser is controlled by a pair of rotary encoders, one to adjust the turnover frequency and one to dial in a generous ±18dB of boost or cut. The high shelf can be tuned from 200Hz to 20kHz, the low shelf from 10Hz and 1kHz, and the mid-band between 100Hz and 10kHz with the two switchable Q values of 0.8 and 2.5. The final front-panel section on the extreme right-hand side carries all of the unit's housekeeping facilities. The first of the top three buttons is used to bypass the entire machine, while the next two provide Compare and Revert functions. The Compare button switches between the current and previously saved program settings, allowing them to be compared non-destructively. The Revert button recalls the previously saved settings, discarding the current parameter adjustments. The lower half of the panel contains the usual memory Save and Recall buttons, along with two more buttons for naming programs. The last button here is labelled Setup, and this accesses the various machine configuration options. The Liquid Channel is an impressive piece of equipment in it's own right, even before you take its convolutional elements into account. The A-D converter has a noise and distortion figure of -109dBFS, and the D-A is specified as -103dBFS, with less than 20ps of jitter from the internal clock. The mic preamp's EIN figure is a respectable -126dB at 80dB of gain and a 150Ω source — remarkable given the very complex input switching circuitry. Among the preamp Replicas are two that provide a totally unprocessed preamp stage with either a transformer input or an electronically balanced input. Critical auditioning in this mode with the compressor and EQ stages bypassed demonstrated the inherently high quality and transparency of the preamp circuitry. It sounded wonderfully neutral and clean to my ears, with plenty of headroom (+16dBu, in fact) and a low, smooth noise floor. Dialling in various alternative preamp Replicas, their sonic signatures were immediately obvious in most cases, particularly when switching to valve-based preamps and those with transformers. Just about every topology is represented here: valves, discrete solid state, op amps, Class A, fully balanced, transformer coupled, direct coupled — you name it, there's a preamp that uses it here somewhere. It's only when you can switch directly between different preamps that you realise that, although a good preamp is always a good preamp, there are sometimes significant differences in the way the source is portrayed. Often, the differences are subtle and easily masked in a mix, but sometimes choosing the most complementary preamp can make the difference between a great recording and a magical one. The same is true for the compressor Replicas, but the differences here are even more marked because, in addition to the sound character of different circuit topologies, there is also the dynamic behaviour — the way different compressors respond to transients and sustained sounds, and the way they recover from gain reduction. The options provided cover all the bases: opto-compressors, solid-state FET compressors, VCA designs; transistor, op amp, valve and digital gain stages; soft and hard knees; and peak and RMS sensing. If you are already familiar with the particular unit emulated, you'll know what to expect, but even if you don't it is very easy just to scroll through the options until you find the one that sounds best for the particular situation. 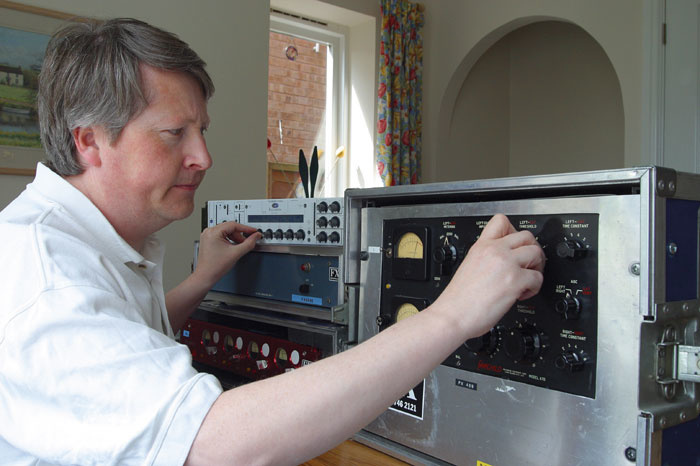 SOS Technical Editor Hugh Robjohns lines up the Liquid Channel against the Pultec MB1 and Focusrite Red 1 preamps, as well as the celebrated Fairchild 670 compressor, in order to critically evaluate the quality of the convolution processing. By using an Audix control box, I was able to switch directly between the outputs of the Liquid Channel and each of the original units in order to make direct comparisons. I used most of my collection of large- and small-diaphragm condenser mics (Neumann TLM103 and KM180 series, Sennheiser MKH series, Microtech Gefell M930, and Audio Technica AT4040), as well as a couple of pretty naff dynamics I had kicking around (just to see what reaction there was to the impedance switching). Sources were some acoustic guitar, a bit of cello, and several spoken and singing voices, as well as line-level signals from a CD player with a variety of solo-instrument and test recordings — the latter proving particularly useful for evaluating the compressors. The crucial question is, of course, how well the Liquid Channel compares to the original units. Well, to my ears I have to say it compares extremely well indeed. In fact, I couldn't tell the difference between the Fairchild 670 Replica and the original at the same settings. There can't be many 670s around in the UK and I wondered if Focusrite had hired the same machine from FX Rentals to make their measurements! It was much the same story with the preamps, although I found I had to dial in some Harmonics to match the rather rich and warm character of the original MB1. Switching to the solid-state Red 1, again I found it very hard to tell it apart from its Replica, and the intrinsic qualities and character of the preamp were readily identifiable. Randomly switching around the other preamps and compressors I was never disappointed, although often overwhelmed with the sheer variety on offer. It was a very wise move to include some 'hot' preamp versions, as sometimes you just need that extra drive and power, and the Harmonics control is a very useful and powerful tool in shaping the sound even further. I was occasionally frustrated when some unfamiliar compressors refused to let me adjust parameters I felt I wanted to change, but it would have been the same had the real box been in front of me. And, of course, switching over to the Liquid Channel's Free mode immediately gave me all the extra control I needed. I'm not so sure this product, impressive though it undoubtedly is, is the best possible investment for the smaller home studio. The quality and range of preamps and compressors here is sublime, but this is a finessing tool and I wonder if the differences might be a little too subtle in circumstances where there are bigger hurdles to overcome than choosing between different preamps. To appreciate many of the subtle qualities and variations available here requires good recording and monitoring environments, and for the UK price of the Liquid Channel you could make significant improvements to your studio's acoustic treatment or purchase high-quality monitors! Having said that, the Liquid Channel is a fabulous and unique product, and I can see it becoming as much a standard studio tool as a Lexicon reverb or an Eventide multi-effects processor — although a dedicated stereo version would be rather nice, especially for mixing and mastering applications. This is an ideal machine for mid-sized and larger studios, either to provide or supplement a flexible range of esoteric and characterful preamps and compressors. This is definitely worth a private audition, but not at a trade show or in a noisy showroom — you need to take the time and trouble to listen to the Liquid Channel somewhere where you will be able to appreciate it fully. Thanks to FX Rentals for loaning the comparison units used in this review. Tel: +44 (0)20 8746 2121. The Liquid Control software requires Windows XP Home or Professional for the PC, or Mac OS 10.2.8 or higher for the Mac. Both systems require a USB 1.1 port and 5MB disk space for installation. The software worked very well in practice and it hardly needs to be described — the front-panel controls and displays are exactly the same as the machine itself, and there are fully bidirectional commands between them so that both displays show the same things, and all the controls do the same things. For this review I stuck with a late pre-release version of software (v0.9g) simply because there seemed no need to update it — everything appeared to work perfectly for me. One handy feature is that the preamp and compressor Replicas can be changed by clicking on dedicated menu drop-downs. I found it much easier to navigate a drop-down list than to scroll through the options on the hardware. Updating the Liquid Channel's firmware and the Replica sets is trivially simple through the appropriate Liquid Control menus, but updating all 80 Replica files takes quite a while! Although the interface to the Liquid Channel is via USB 1.1, I understand that Focusrite can supply Cat 5 USB converters to enable the unit to be controlled from a remote computer instead of one at the end of a shortish USB cable. This will be a far more attractive option to many studios. 40 preamps and 40 compressors in the one box. The promise of future additional Replicas as free downloads. The Replicas can mimic the control restrictions of the units which inspired them, but they can also allow much more flexibility if required. Two units can be linked for accurate stereo operation. High-quality preamp in its own right. Flexible configuration and I/O facilities. Potentially too subtle for many home-studio applications. An impressively versatile machine that recreates the nuances and subtleties of a range of rare and esoteric preamps and compressors with remarkable fidelity. Those with the budgets and space may still prefer the individual characters of original units, but the Liquid Channel affords the rest of us the chance to share and enjoy the qualities associated with so many classic preamps and compressors.